During every episode of the 50s television series “Dragnet,” Detective Joe Friday, Actor Jack Webb, would inevitably say, “Just the facts, ma’am.” The witnesses were so caught up in their emotions that the facts were being lost. Knowing that their testimony had serious consequences most adhered to Joe Friday’s admonishment. Unfortunately the Trump haters of today have chosen to disregard Joe Friday’s statement. Apparently “just the facts, ma’am” is as outdated as the black and white television sets that “Dragnet” appeared on so many years ago. In a recent interview on Fox News, Mark Hetfield, CEO and President of HIAS, an organization which is compensated by taxpayers on a per refugee basis, reiterated his position that the new immigration policies had “abdicated American values.” That statement naturally caught my attention as I am one of the overwhelming majority that would like to see control taken of the refugee problem creating a safer and more secure America for everyone. Had I somehow turned my back on the American values that my family had defended in so many wars? If I had I would certainly like to be set straight with the facts from Mr. Hetfield. When asked to define the American values that I had apparently abdicated I heard a shift to the responsibilities of HIAS. When asked to explain what his criteria for refugee entry was or simply his rules of the game he shifted to the immigrant policies of the 20s, he said that we, meaning me, had an obligation but couldn’t define what that was specifically. I decided to move on as my frustration continued to build at being perceived as a bad American and not being given the facts as to how to correct myself. Having heard of the president’s recent nominee to the Supreme Court, Neil Gorsuch, I was excited about the man who had clerked for President Kennedy’s only appointee, Byron White. 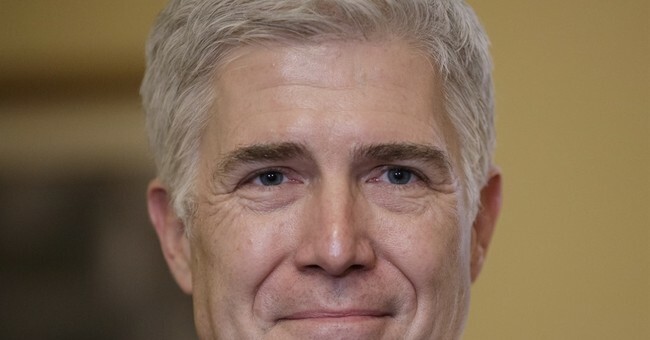 I examined some of Gorsuch’s decisions and rationale. On the surface he appeared to be a strict constitutionalist, fair and of independent mind. I say this with the brief amount of facts I was able to gather in a short period of time. Obviously, however, I was in error. Having heard Marge Baker, executive VP of People for the American Way, being interviewed on FOX, I had to re-think my position. “He’s a tool of Wall Street and corporate America …he won’t pushback…not of independent mind…not fair…won’t protect the Constitution,” she said. I then waited for her litany of facts that would support her position. She continually brought up the Hobby Lobby case where Gorsuch sided with the Supreme Court’s ruling. I failed to see how supporting religious freedom was an attack on the Constitution nor did Marge help me understand. Remember, however, I was an accused abdicator of American values. I was sure that eventually Ms. Baker would overwhelm me with case after case and decision after decision that would prove, perhaps not all, but at least some of her allegations. I just had to wait long enough. So I waited and waited and waited. Unfortunately she was just another liberal ignoring Detective Friday’s request. Perhaps, I thought, I should focus more on the man in the street as opposed to a CEO or an executive VP. I was sure someone would give me the facts that I was looking for. A protester and organizer from Portland, Cameron Whitten, seemed armed and ready to substantiate why he and others were attempting to shut down airports across the country. Unfortunately he started to lose me when he responded to the question of whether he had actually read the Executive Order by stating it was “too much to read.” He then compounded my frustration by stating that Trump’s victory was the first time in American history that a president had been elected without the majority of voters. That will come as a surprise to Bill Clinton, among others. The final straw came when he was asked to name the seven countries listed in the executive order. He knew only two, Iran and Iraq. Then he gave up after listing Turkey, not on the list. Why let facts get in the way of emotion? Debate and opinion is a fundamental right in this country. Unfortunately when one side is armed with only emotion and refuses to state the facts can they be really taken seriously? The Trump haters would do well to take advice from an old TV detective.